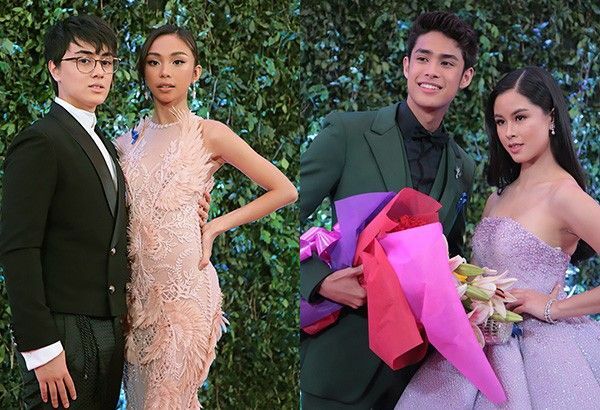 Kapamilya love teams MayWard (left) and DonKiss at the ABS-CBN Ball. MANILA, Philippines — If she and fellow Kapamilya star Maymay Entrata were to have a dream project, Kisses Delavin would pick a light one based on a story of friendship. That is how strongly Kisses feels for her fellow teen star, whom fans want to pity against her on social media. Kisses’ imagination goes on overdrive. Maymay, she said, will be Lastikman (a comics character with the power to assume any shape he wants). Kisses, meanwhile, will be happily playing a Powerpuff girl whose powers complement Lastikman’s. This willingness to adjust to Maymay’s character shows just how deep the friendship between the two young stars has grown. It proves that popularity has failed to get the better of Kisses, who plays Velma in iWant’s “Ang Alamat ng Ano” (along with Maymay’s Nura). Thus, the two friends can wrestle in the mud for as long as the director wants, or pull each other’s hair to show rivalry on cam as Nura and Velma. But Kisses and Maymay will do their best to turn their faces away from the camera because they are laughing while shooting the “fight” scene. It is easy to extend this rivalry off-cam. Someone pointed out that Maymay’s “morena” skin mimics Nora’s. Kisses’ round-shaped face is similar to that of Vilma’s. The similarity can fan the flames of rivalry that has made showbiz doubly exciting through the years. While admitting that the situation is unfair, Kisses understands that rivalry translates to higher social media views. But, like Vilma who calls Nora “kumare,” Kisses will not let this ruin her friendship with Maymay. “You can’t avoid comparisons,” Kisses noted.